July has been a washout weather wise, with a sprinkle of sunshine,.. just to tease us! This in mind I thought I’d take you right back to beginning, where the Holford name originally came from and its watery roots! FORD – a shallow place to cross a river. The river being the tranqil brook, the Peover Eye, which runs through the estate. Peover comes from the welsh langauge, meaning darting or sparkling; with Eye originating from the Anglo Saxon term for small stream. 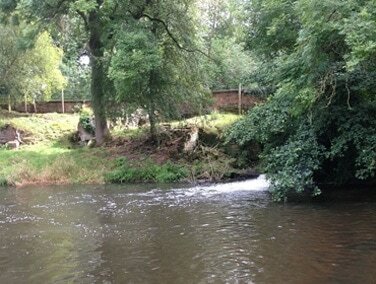 This river fulfilled the water requirements for the Hall and its farm land, along with creating an income from its’ mere and water Mill, and as a food source with fish stocks, particularly Trout. To this day the River is a great feature of T.H.E, the sound of the water, the animals it brings and is simplistic beauty to look at. I’d say the pack of four legged furry friends love it more than we do o a hot day! !